Did you see Don Day's blog post You are invited to a special seafood dinner paired with wines from yesterday about Grill Torres? Check out the link to Don Day's article but the special seafood dinner is already sold out. If you missed it, subscribe to his blog so you get earlier notice next time. Grill Torres (Google Map link with their current location just off Ancha San Antonio at Cjon. de la Bayoneta 2). Facebook page. And they now serve breakfast! Check out their breakfast menu. (Click for larger view). More Don Day reviews (but note these refer to their old location): Grille Torres. Nice shrimp. Nice salmon. Nice guy. and Cazón. Worth the seven blocks just to try it..
Mauro Torres is a nice guy and if you are vegetarian, he will make you up an off-menu vegetarian sandwich, or steam some vegetables, or, .... Just tell him what you can eat. Oh, and people that like seafood tell me that they love his cooking. We walked over to Grill Torres earlier today for the breakfast. With their new breakfast menu they have a lot to choose from: French Toast, Pancakes, Eggs Benedict, Crepes, Breakfast Potatoes, Oatmeal, Breakfast Casserole, Coffee, Tea and Juice! 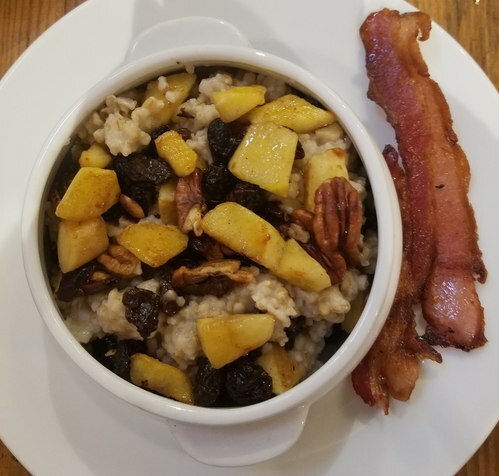 I had the steel cut oatmeal with fruit and nuts and Victoria had the gluten free banana and oatmeal pancakes. Mmmmmm....excellent! 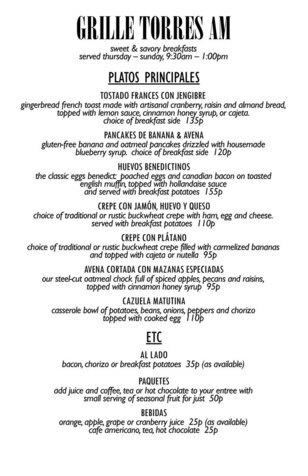 Note that Grill Torres serves breakfast Thursday - Sunday 9:30am - 1pm. If you're reading this Monday morning...you'll have to wait until Thursday. Mexican wines featured at the new and very improved Grille Torres. About three and a half years ago, I was shopping ..., a sign caught my eye, a classy looking sign, with the words Grille Torres. The menu persuaded me to stay for lunch and I had some imaginatively-prepared shrimp as well as an exceptional piece of salmon. Read more at Don Day's Blog: Mexican wines featured at the new and very improved Grille Torres.